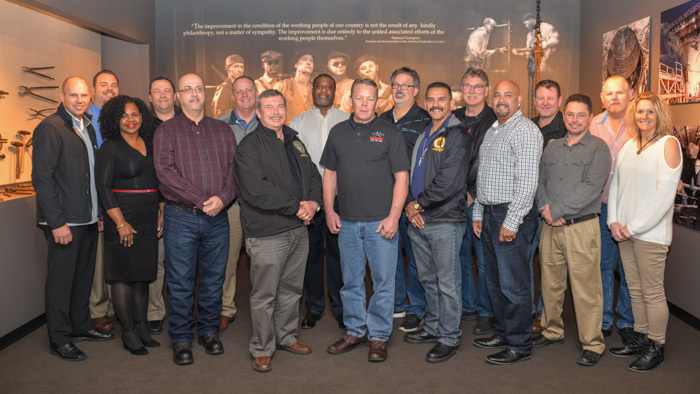 THIRTEEN INTERNATIONAL REPS honed their lodge servicing skills by attending a training course conducted by Industrial Sector Operations in Kansas City, Missouri, Nov. 14-16. The course included roundtable discussions and presentations on topics such as mediation, contract negotiations, organizing and arbitration. Pictured above are, left to right, IR Dan McWhirter, ED-ISO Tyler Brown, IR Erica Stewart, D-OS-ISO Jody Mauller, IR Dwain Burnham, IR Jeff Campbell, IR John Seward, IR David Gaillard, IR Dan Luhmann, D-IT Curt Smith, IR Adrian Maldonado, IR Bill Coleman, IR Miguel Fonseca, IR Fred Rumsey, IR Don Hamric, IR Bill Staggs and IBB Research Assistant Debbie Goodwin.